Worlds Collide is a journey of the spirits at the musical crossing points of Brazil & Cuba, Africa & the Americas, the Caribbean, Celtic, Arab & Moorish worlds...all touched by the colors of Jazz. This music is the place where the tides cross, at the juncture of the deep human heart and the endless spirit of nature. Flutes, Voice, Chorus, Percussion, Cellos, Keyboard & Bass in beautiful colors and rich jazz harmonies, combine in a powerful roots rhythmic connection of Afro-Brazilian, Cuban and Haitian original sounds. 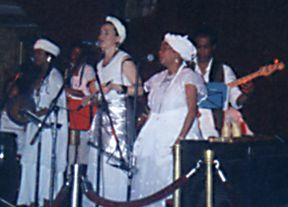 In Worlds Collide Anne Pollack & Magica have created a musical home for the Afro-Brazilian devotional songs of the Yoruba religion, called Candomblé...of Bahia, Brazil. Music that will make your body dance and spirit soar!! Read "The Beat" Magazine Review! I will be playing a lot more of [this] on the air... because [it contains] alot of beautiful music." "A marvelous synthesis of sacred sounds! For peoples of the Afro-Atlantic world, the arts are offerings to invoke, honor, and celebrate the spiritual forces that shape our lives -- goddesses, gods, ancestors. The performative force (AXE) of these musical gifts is truly inspiring!" "The rhythms and traditions you are working with are close to my heart...it sounded lovely."